Welcome to Chocolate and Africa Theme Weeks. Over the next few weeks, we'll be virtually traveling across this great continent, from east to west, sampling a new chocolate made with African cacao each day. Let's start our journey in Madagascar, a sizable island nation off the coast of Eastern Africa, also known for its fine cacao with red fruit notes and often a lighter/redder color. Today's award-winning* 72 percent Cacao Madagascar bar was made (bean-to-bar) by The Smooth Chocolator (Australia)—from cacao beans grown at Akesson's organic estate in the Sambirano Valley area of Madagascar. Akesson's supplies several chocolate makers with beans. 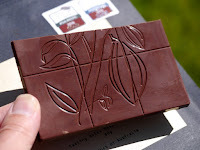 However, even if different chocolate makers are using the same harvest and/or batch of cacao grown on the same land, each maker's finished chocolate will taste slightly different. This is due to the many choices and decisions made during the rather long process of making chocolate. Tasting notes printed on the packaging for today's bar promised hints of raspberry and plum. And, in fact, this attractively designed and functionally (resealable) packaged bar delivered a very nice tart ripe plum and red raspberry ride. It began with a complex red fruit and fig aroma and moved on to a satisfying tasting experience. There was a touch of spice flavor at the beginning, and lush plum and red berry fruit all the way through, including a lingering red fruit finish. 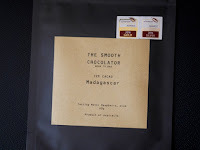 *This 72 percent Madagascar bar from The Smooth Chocolator earned both International Chocolate Awards Asia-Pacific 2016 Gold, and International Chocolate Awards Americas 2016 Silver.